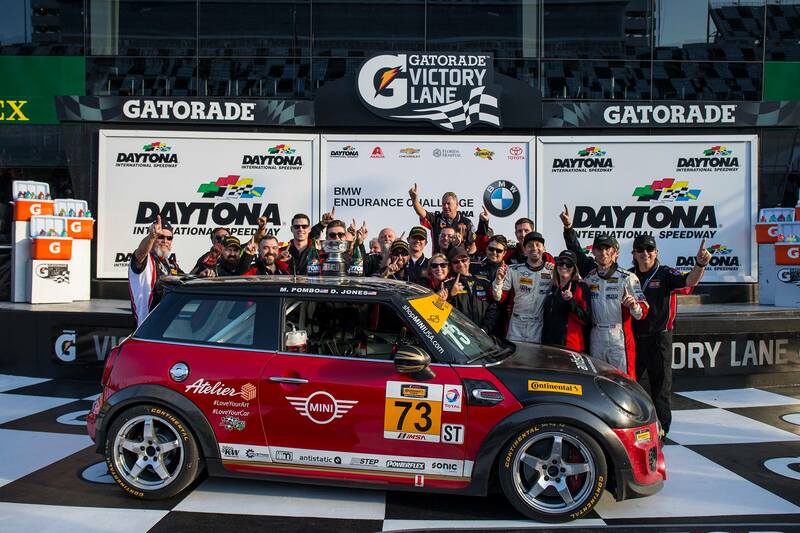 Race Recap: MINI Wins BMW Endurance Challenge! The weather was perfect, and if you were a MINI fan the race was too. Two years of hard work finally payed off with the MINI JCW Team’s first ever victory in the Continental Tire SportsCar Challenge (CTSC). 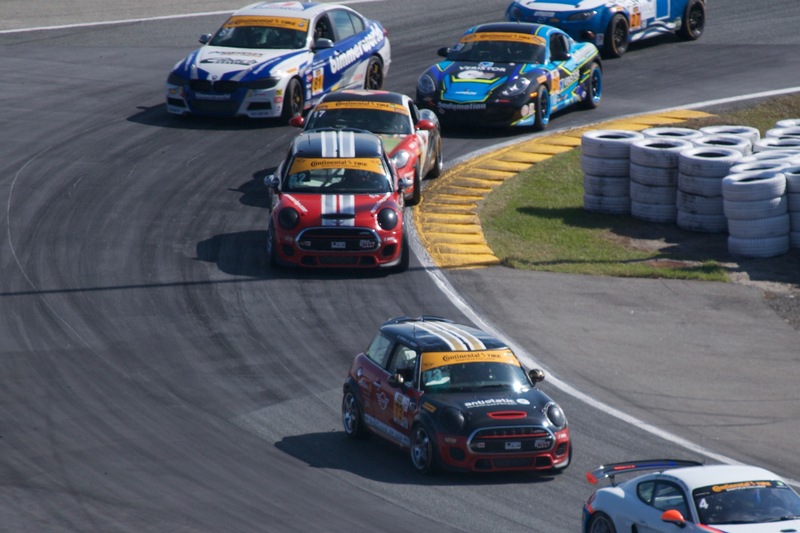 From practice to qualifying to race day the MINI JCW Team showed they will be a championship contender this season. 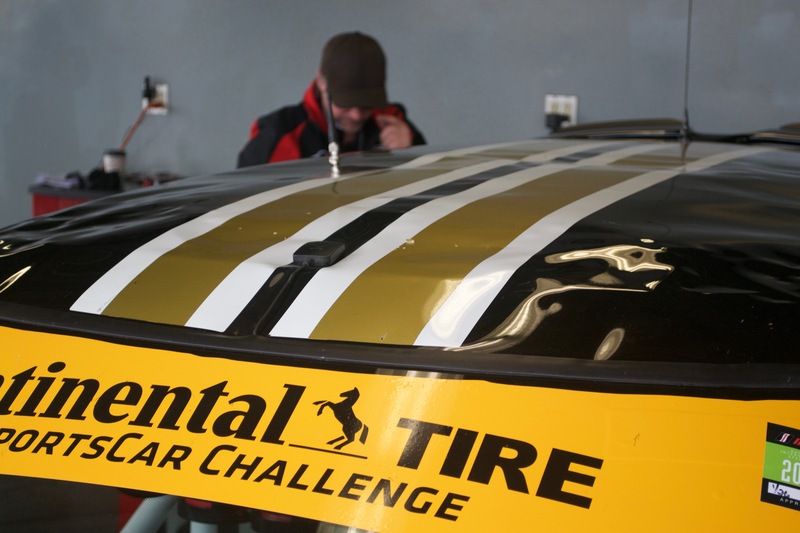 There were a number of changes made for this season of the CTSC. Among them were the shortening of race weekends and reduction in time for eight races from 2 1/2 hours to 2 hours. The remaining two, including the season opening BMW Endurance Challenge were changed to four hour endurance races. The shortened race weekend led to a busy Thursday before the race. With four practice sessions in addition to qualifying teams would have plenty of opportunities to test their car but not a lot of time between sessions to work on them. Luckily for the MINI team they rolled off the truck fast. The 73 with Mat Pombo behind the wheel set what would be the fastest lap in all of practice in the first session of the day. The 37 and 52 were not far behind in times. Though being the fastest the 73 did suffer one issue during practice. The bonnet flew up damaging the windshield and roof of the car. The 73 would sport a black replacement bonnet for the rest of the race weekend. With the 73 repaired and over 2 1/2 hours of practice complete it was time for team to get down to business. 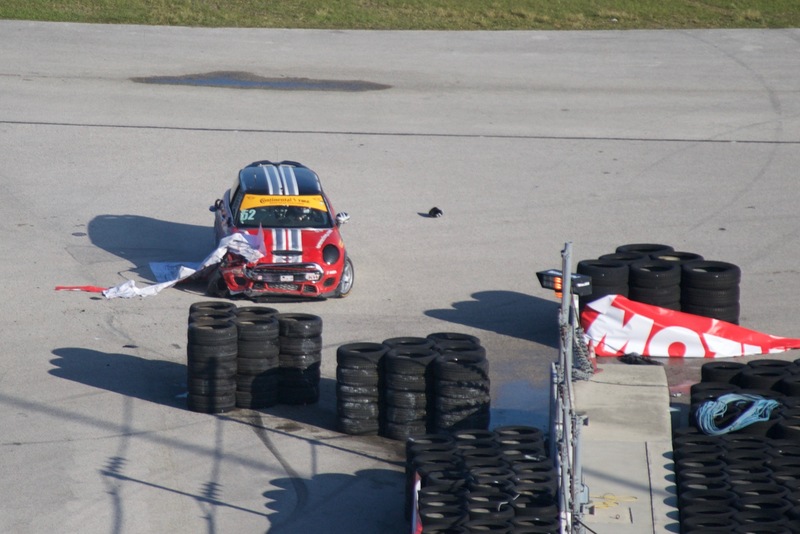 Qualifying in CTSC is always frantic. With only 15 mins to put in a fast lap around the 3.5 mile course teams scramble to make their circuits. Qualifying the cars were Derek Jones in the 73, Nate Norenberg in the 52 and Mike Lamarra in the 37. All three drivers had great runs with Jones being the top qualifier in 3rd. Norenberg followed in 6th with Lamarra in 9th. With all three MINIs in the top ten things were looking good for Friday’s race. The race day started off with a driver Meet and Greet where a raffle was done to win 1 of 6 hot lap prizes (see 2016 hot laps video). The drivers chatted and took pictures with fans as everyone was able to get a close up look of the cars. The turnout was great, MINI fans have really taken a liking to the team and were rewarded for their attendance later. If you’ve never been to a Meet and Greet be sure to make it a priority in the future. The four hour BMW Endurance Challenge would not only test the durability of the MINI JCW, but the focus of the drivers. With stints over twice as long as any the drivers had run last season, their resolve would be tested. The 52 continued to be the snakebitten MINI on the team. Despite starting 6th the 52 was in for a rough day. Only 3 laps into the race Norenberg had contact with a Bimmerworld BMW. Luckily this didn’t seem to cause to much issue as he was able to continue on. But later while under a full course yellow the 52 entered the pits with no power. This created a dicey situation as other cars tried to maneuver around the MINI as it was stationary in the middle of pit road. IMSA officials were able to move it safely out of the way and it was taken behind the wall. Eventually the #52 would return with Mark Pombo behind the wheel. But as the race neared it’s conclusion the 52 would end its day with impact into a tire wall. The 37 had a bit of an up and down day. Started by Lamarra the car held steady early in his stint before falling back slightly. Lamarra had good pace and kept the car clean as he did an excellent job in his first race for the team. Lamarra completed a long just over 2 hour stint before turning the car over to James Vance. James who only recently had re-signed with the team looked as if he hadn’t missed a beat since parting with the team in the middle of last season. He expertly guided his JCW back to front joining the 73. For a period of time it looked as though not only was the team in for a victory, but a 1-2 finish. With only 7 minutes remaining the 37 was forced into the wall by a competitor and would end its day parked in the infield of turn 3. The 73 was the main focus of most of the fans attention, just like it was last season. 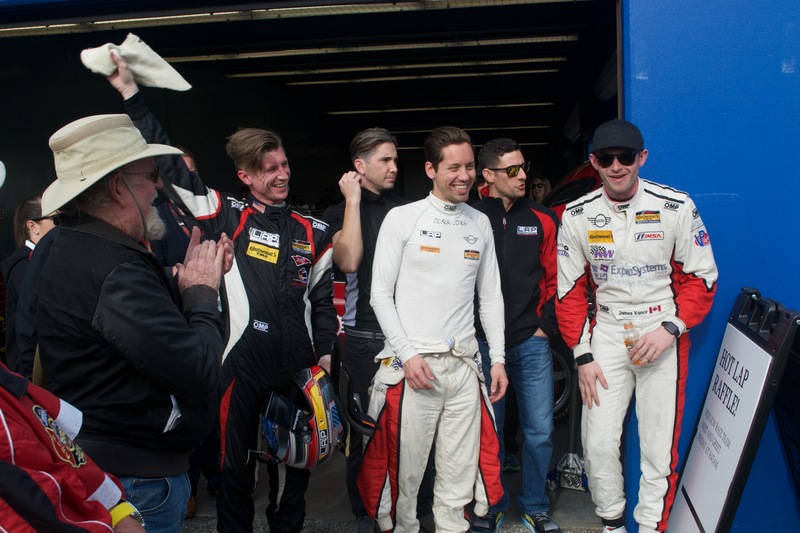 The driving pair of Jones and Mat Pombo has proven time and time to be the strongest of the bunch. The two are responsible for the only podium finish the team earned previous to this season. They looked every bit as strong in this race as they have in past seasons. After first having the fastest lap in practice, and then qualifying 3rd they looked to continue their strong run into the race. Jones held steady to start the race. Mastering his line and biding his time he slowly worked his way forward from his already great starting postion. With just over an hour passed in the race Jones finally found his opportunity and took the lead of the race. 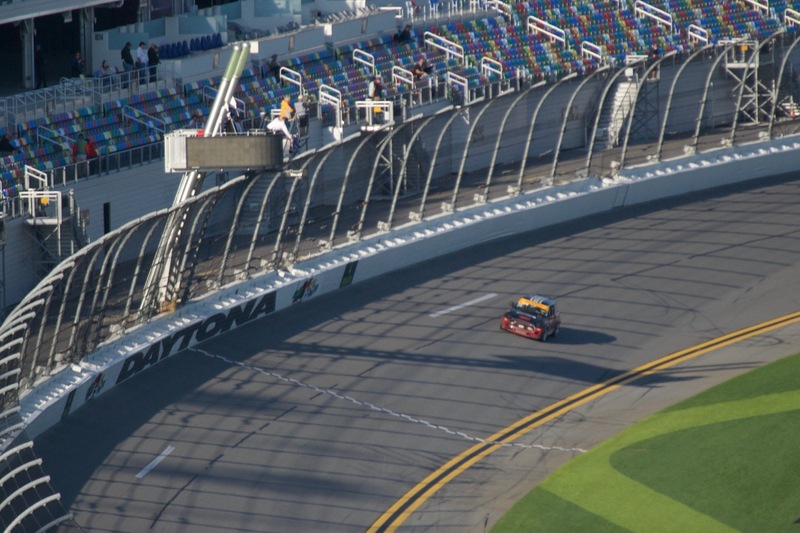 For much of the next hour a MINI would be leading the race at Daytona. There were lots of different strategies being played as a 4 hour race was new territory for most of the teams. When it finally came time to pit the crew had a flawless stop, but Mat Pombo re-entered the race in 5th. Over the remainder of the race he would race his heart out as he tracked down the cars in front of him. Lap after lap you could see the gap closing between Mat and the cars in front of him. It was no fluke that he had the fastest time in practice, he was definitely the fastest driver on the track. Mat had a sizable lead with just over 10 minutes remaining. That is when the 52 crashed into the tire wall. With a full course yellow being displayed the field was packed together again. Tensions rose as fans feared that the race could have just been taken away from them. Restarts can be crazy and that could be just the opportunity the competitors needed to take advantage of Mat. Mat put all those fears to rest as he got a clean restart. He continued to drive away from the field just as he had been doing before the caution came out. With no one able to challenge Mat he crossed the line first for the MINI JCW Team’s first ever victory! With such a great start to the season the sky’s the limit and the team will look to carry this momentum forward through the rest of the season. MINI Results are below. Full field results can be found here.